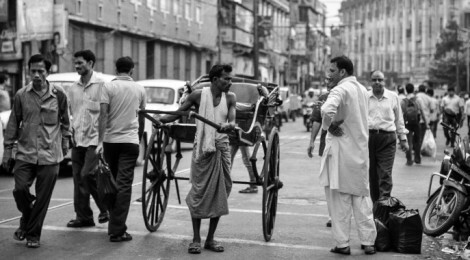 Calcutta (now Kolkata) with over 300 years of history had seen a lot of upheavals. It had been the capital of the British Raj (after East India company assumed full sovereignty) till 1911 when the apparent geographical disadvantages (in comparison to Delhi which had been the capital of power for the Mughal dynasty and the earlier invasions) coupled with the rising Nationalist fervor amongst the Bengalis led the British to shift the capital back to Delhi. Being the administrative capital of the British settlement in India till 1911, Calcutta by natural choice had a number of architectures designed and constructed by the British – not only as monuments and historic relics but also for running the administration. However, as the Indian Railways was conceived to tie up the different parts of the country for their own benefit, the British didn’t pay much attention towards improving the public transport to their first capital Calcutta. As a result after Independence, when a survey was conducted, it was found out that roads account for only 4.2% of the surface area in Calcutta as compared to 25% in New Delhi and even more in the other metro cities. This was what prompted the start of the first underground metro rail in Calcutta in the mid ‘80s almost 15 years after the Metropolitan Transport Project (Rlys) was set up in 1969. This is important since till the mid ‘60s the northern part of the city had equal or at times more relevance in the Bengali psyche than the southern part – and the landscape of the North Calcutta (as it is popularly known as) amply justifies the meagre 4.2% commutable land. During the last century Calcutta had witnessed fire during the last leg of the Indian national struggle and at the penultimate hour the partition of Bengal (the price Bengal and Punjab had to pay for their overt involvement in the national struggle; a partition of Bengal and Punjab which is practically different contextually from the general term – a Partition of India) led to millions of Bengalis from East Bengal (now Bangladesh) thronging the streets of Calcutta. Shortly before the massacre of partition, Bengal was dealt a serious blow in the form of the Great Bengali Famine of 1943 that reportedly killed lives in excess of three million. And within a couple of decades, in the later part of 1967 the Naxalite movement started its presence being felt in the state of West Bengal in general and the city of Calcutta in particular. The reason for such a preamble is to find out how cinema being a relatively new art form, got influenced by these major changes of the city. Even before Mrinal Sen made Calcutta 71 in 1972, he had focused on the city of Calcutta and the changing dimensions of the inhabitants there – markedly different from what the more revered Satyajit Ray’s films had to offer. Akash Kusum (1965) by Sen for example showed a fractured dream – the reality of the post war Bengal where all the apparent Nehruvian ideals fell flat. Important to note here is in the previous decade – Bengali cinema saw the rise and conquest of its first (and arguably only) star couple in Uttam Kumar and Suchitra Sen. In most of the twenty-odd films they had made together in that decade it was the flight of an individual from the rural space to an urban background – primarily the city of Calcutta. This flight is like a discovery – of the city space and in turn with the notions of modernity. And almost always the filmic landscape is divided between a topography that represents the poor reality of the protagonist as opposed to the rich and affluent excesses of his/her partner. In addition to the different landscaping that positions the perennial dichotomy of the rich versus the poor, these films often had a number of shots showing the monuments and relics of Calcutta. As a result we find ample shots of the Victoria Memorial, the Howrah Bridge, the General Post Office and the Administrative buildings. These backdrops served as exhibits (ala a tour of Calcutta) to the large rural audience whom the hero of the film chose to represent and also as a representation of the power and dominance which the hero or the heroine sets out to fight against. In this context Sen’s Akash Kusum is important – because here is a time when the hero (a magnificent Soumitra Chatterjee as Ajay) finds it difficult to deal with the city of his choice. He is no longer a migrant but now he is a dweller here, wishing to rise above his mundane existence and thwarted by the social matrix in which he gets trapped. In one defining shot the hero goes on top of the highest building of Calcutta and exclaims in ecstasy – “Shala, will buy the whole of Calcutta one day”. Ajay seems an extension of Apu in the third part of Apu Trilogy – Apur Sansar (1959) by Satyajit Ray. Whereas Apu (played by the same eloquent Soumitra Chatterjee), again a migrant to the city preserves the charm and innocence of his rural ancestry, Ajay in Akash Kusum seems to have lost the innocence. He looks out of himself not with awe but with disbelief, disrespect and at times manipulation – the traits of a modern citizen of a modern city. In contrast Satyajit Ray’s first film on Calcutta – Mahanagar (1963) does have a similar resonance where the first signs of unrest and disbelief within the middle-class Bengali family rocks the citadel of domesticity and the unconditional love and dreams rooted therein. We find Arati (Madhabi Mukherjee never fails in any Ray film), a docile home-maker going out for the first time to earn for her family when her husband loses his job. Ray in deft touches portrays the socio-political conflicts of the middle-class – now bare and exposed in front of the social necessity. Whereas Arati confronts her ‘stepping out’ with coy, elegant stupor, Chinu of Ek Din Pratidin (1979, Mrinal Sen) is more self-reliant and assured. She doesn’t come home from her office one night, sending a series of shock waves amongst her family members including an adult brother and sister and aged parents who suddenly realise how dependent they are on Chinu. Chinu comes back the following morning to face a glaring introspection of the neighbors but little does she care. In Ek Din Pratidin and in most of Mrinal Sen’s films we find narrow lanes growing almost on the characters. It is this claustrophobia which Sen wants to portray in his films on the city – spaces unlike the extravagant mansions of the mainstream films. These spaces are real and noticeably, most of the times, Sen’s characters are not the ones ravaged by the Partition of Bengal. His characters are definitely middle-class but the setting is almost always reminiscing the northern corner of the city. Indeed it is the older part as well where the Bengali Renaissance of the early 19th century still left some of its last traces unlike Satyajit Ray whose characters like him, moved to the more affluent and distinctly more modern South Calcutta in the master’s later films. Interestingly, the third member of the holy trinity Ritwik Ghatak based his entire oeuvre on the cinema of partition and the melodrama of longing for land lost and failure to claim new territories. In Meghe Dhaka Tara (1960) for example, the refugee colony and its geographical setting finds little importance in the bigger canvas of mental turmoil and drama. The focus is on the individuals, their mutual equations and the elements of nostalgia for East Bengal. Two years later in Subarnarekha (1962) Ritwik takes us on a city ride with his two characters before one of them unknowingly enters his lost sister’s quarter in search of sexual favour – is this Ghatak’s Paradise Lost? However, it is still the softness for the middle-class Bengali which lingers in these films. With the Naxalite movement and the sporadic killings of youth, things deteriorated fast – what seemed obnoxious in 1965 didn’t seem to disturb the audience enough in the 1970s. In Ray’s Mahanagar the film starts off with the image of an electric hook on the electric overhead wire in a tram line. As the title card rolling ends we are thrown into the city’s cauldron quite suddenly as if we rise from a slumber – that is what a metropolis is to you in a poetic demonstration. In Jana Aranya (1976, Satyajit Ray), the last of Ray’s Calcutta Trilogy, the lyrical establishment paves for a more real and radical examination hall – with Naxalite and Maoist slogans on the wall above and on the sides of the blackboard. There are rampant copying by most students but the invigilators put a blind eye to all that – even when one of them questions the students he is jeered down. As the camera zooms in we find that the examination is of ‘Calcutta University’- Ray directly puts questions as if he is to embark in testing the merits of the city of Calcutta in the lights of contemporary happenings. Unlike most of Ray’s earlier films the trilogy is devoid of visual pleasures as such – Ray is caustic yet neutral, rational without not taking sides in principle. From the 1980s Bengali mainstream cinema lost its city focus. Shatru (1984, Anjan Chowdhury) which became a massive hit in the rural Bengal exemplifies the distinct shift of mainstream Bengali cinema. Here, an honest police officer (Ranjit Mullick) when transferred to a village on duty almost single-handedly nullifies corruption, bringing justice to the poor. This ‘formula’ is straight-away lifted from Hindi cinema which in the 1970s excelled in the same plot of one individual’s fight against the corrupt system typified by the emergence of Amitabh Bachchan as a superstar. Interestingly, it started off a trend in Bengali cinema which henceforth started to borrow handsomely from the cinema of other regions – from the South along with Bollywood. Also noteworthy is the fact that after Ranjit Mullick it was Prasenjit who provided a number of commercial hits playing almost the similar profile of honest administration ‘saving’ the village from the ills of dishonest politicians and businessmen. This is indeed an important observation since the flux from the village to the city which started with Uttam Kumar in the 1950s makes a complete circle with the cinema of Prasenjit almost four decades later albeit in the opposite direction. The spelling of the city changed from ‘Calcutta’ to ‘Kolkata’ in the year 2001, seven years after Rituparno Ghosh started off his career with Unishe April (1994). By 2001 the entire scenario of the ‘parallel’ Bengali film industry changed to indoors, courtesy Ghosh whose first few films relied heavily on dialogues with mostly static camera and holding the interior space both physically and metaphorically. Obviously, the changing landscape of the city got missed from the reel reality – if Ray’s primordial imagery of communication seemed to be the moving train no Bengali director ever tried to capture the underground metro rail – a unique symbol of Kolkata for quite a few decades before the same came up in the other cities. Only recently Suman Mukhopadhyay’s Herbert (2006) and Mahanagar@Kolkata (2010) holds the city with its angst. Herbert, due to its lineage from the novel with the same name by Nabarun Bhattacharya, quite poignantly holds the North Kolkata in elegance and despair – images which were lost in cinema. Unlike Open Tee Bioscope (2015, Anindya Chattopadhyay) which sets off to create a nostalgic yearning for the lost childhood of the audience and probably of ‘Calcutta’, Herbert is tragically real and hence more honest to the narrative it sets off to depict. What Herbert does to North Kolkata, Sthaniya Sambad (2010, Moinak Biswas and Arjun Gourisaria) does to the existing colonies of South Kolkata. This film moves through the heart of the city from the extreme South via the ‘White town’ (Park Street) and ending at the ‘New Town’ at Rajarhat. Sthaniya Sambad brings back the dialect of the East Bengal in its colloquialism – a trait which is fast getting lost in translation. In recent years Kahaani (2012, Sujoy Ghosh) though being a Hindi mainstream film, dissected the city with perfection thereby giving a palate which is recognizable yet not clichéd. The mainstream Bengali cinema travels outbound again – now from the local to the international. Most of the commercial films are shot in foreign locations and the story ensures that there is no spatial reference as such, and if any at all, definitely not with mainland Kolkata. The middle-cinema is yet to find a way by which the city becomes a character in itself similar to what we witnessed in the cinema of ‘50s –‘70s. In Bollywood even within the mainstream genre, Mumbai has found its important position – not only to show the underbelly of the city but also to portray its vibrancy. Only future will tell if Bengali cinema can embrace the changing mutations of Kolkata’s fast-changing and ever-expanding demography. That it will enrich itself in the process is probably beyond any doubt. Amitava Nag edits cinema magazine Silhouette and writes extensively on cinema. He also writes poems and short fictions in English and Bengali, his topics mostly veering on the sub-alterns. Amitava works in a software company to earn his daily rice and dreams of making his own film one day.